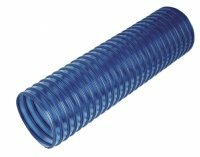 SF LFC – Leaf Collector(SF-TPUW-HW Heavy Wall 0.045”) An economical alternative to cumbersome rubber hose. Polyurethane wall for superior abrasion resistance. UV stabilized for outdoor use. Lightweight, good flexibility, smooth interior for optimum flow. Encapsulated wire helix.